There's a general belief that spring is the best time for planting but, in our climate, this is not necessarily the case. Though the days are shorter and the nights cooler in winter, we don't have long periods of freezing temperatures. In fact, winter is the best time of year to plant trees and shrubs and is an ideal time to establish new gardens. Plants can spend the next couple of months settling in and developing a nice, strong root system. They will be ready to take off when the warmer weather arrives again in mid to late August. This is especially important for plants that will be a part of your garden for many years. A strong root system is crucial for a long and healthy plant life. Fruit trees, feature trees, hedges and roses can all be planted now. 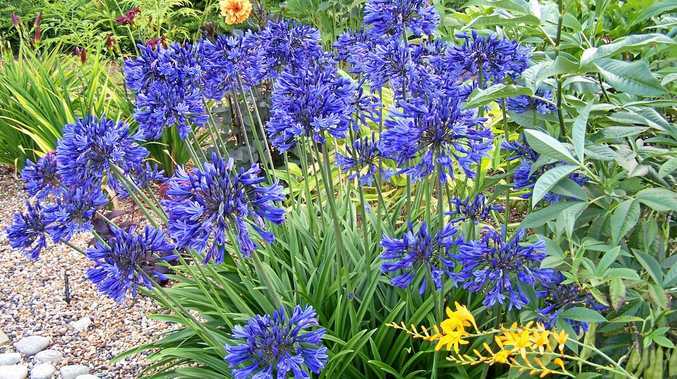 It's also a great time to create new plants from old by digging up and dividing perennials and clumping plants that are already in your garden. It's really easy to do. Get a garden fork or spade under the clump and lift gently. Shake off the soil around the roots and, using sharp secateurs, divide the plant up, taking care to keep each little plant intact. I usually remove all the leaves at this point too. Replant some of the pieces in their existing location and plant the remaining pieces wherever you want. Water in with seaweed solution to encourage root development and that's it. Most strappy plants such as agapanthus, mondo grass, liriope, cliveas, some bromeliads, lomandras and dianellas can be divided this way and you can use the same technique to divide heliconias and gingers. Plenty of ground-cover plants will grow roots along the stems as they spread and these parts can be removed from the parent and planted out on their own. Gently search under the foliage until you find a part of the stem that is well-rooted in the soil. Make a clean cut along the stems to separate the part from the rest of the plants and gently dig out the root ball. This piece can be planted in a new home, where in time it too will spread. Plants that handle this sort of treatment well include most low, spreading herbs and perennials. I find the ground-cover daisies especially co-operative. Reusing existing plants in this way serves many purposes. It refreshes the plants, perhaps extending the life that you might otherwise achieve from a plant. It gives some coherence to a garden - repeat plantings help to create a sense of unity. And if you can fill little nooks and crannies in your garden this way, you can invest in that special or feature plant you might fall in love with when you are doing that other winter gardening activity - visiting one of the many collectors' plant fairs or garden shows that are on in your area.